Pumpkin! I’ll admit it, I’m one of those people that absolutely loves all things pumpkin. As much as I hate seeing every restaurant, coffee shop, and fast food chain advertising their latest pumpkin pleasantry, I just can’t help myself. It’s too good! For some reason I completely forget about this magical fruit? for the other nine months of the year, but when fall rolls around it’s all pumpkin all the time. Needless to say, we’ve been experimenting with pumpkin recipes deep into the night for the past few weeks. We’ve got a few that we’ve finalized now and will be putting out shortly, but this one might just be my favorite. Check out this Keto Pumpkin Bread! 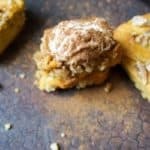 If you’re looking for a keto pumpkin bread that packs in the pumpkin flavor while not being overly sweet then this is it! It’s not quite a dessert bread. It’s comparable in sweetness and consistency to banana bread. The sweetness can be tailored to your taste. In this recipe, we used liquid stevia and erythritol, but you can get by with just one or the other, or a different sweetener altogether. Another thing to be conscious of is that the recipe displayed below is for two mini loaves of keto pumpkin bread. If you’re using a standard 8×4 inch loaf pan, you’re going to want to multiply this recipe by three and bake for 45 minutes. This recipe is as simple as it gets. You pretty much just combine everything in a food processor or using a hand mixer and bake it. Another cool thing about this recipe is that the base can be tweaked to accommodate any flavor you want to achieve, it doesn’t have to be pumpkin (but I’m making the most of my three months of pumpkin this year). We’ve done a bunch of different breads using this base. Most recently, we made a really good loaf of cheddar chorizo bread. Ok, now you’ve got your keto pumpkin bread, but if you really want to impress, you have two options. Pumpkin Pie Butter or Pumpkin Pie Whipped Cream. Both of them are super simple to whip up really quick. For the butter, just combine some softened butter, pumpkin pie spice, and some sweetener to taste. Mix with a hand mixer and spread on to your keto pumpkin bread for a little taste of heaven. Now, the whipped cream. Take some heavy whipping cream and beat with a hand mixer until it forms a cream. Add in some pumpkin pie spice and some sweetener to taste and hit it for another few seconds with the mixer. Serve and enjoy! This recipe makes 2 mini loafs (4.7 x 2.4 x 1.2 inch (x2)). Multiply this recipe by 3 for a standard 8 x 4 inch loaf pan. Bake for 45 minutes. Combine all ingredients other than the walnuts in a bowl. Mix with a hand mixer or using a food processor. Add in 2/3 of the walnuts and lightly mix with a spatula. Pour the mixture into the mini loaf pans. If you want to use a standard 8 x 4 inch loaf pan, multiply this recipe by 3 times. Top with the remaining walnuts. Bake for 30 minutes at 350 degrees. Remove from oven and allow to cool for 10 minutes. Enjoy!